Time waits for no one, as the old cliché goes, a statement whose meaning the young can barely grasp and alas, I am young no longer. 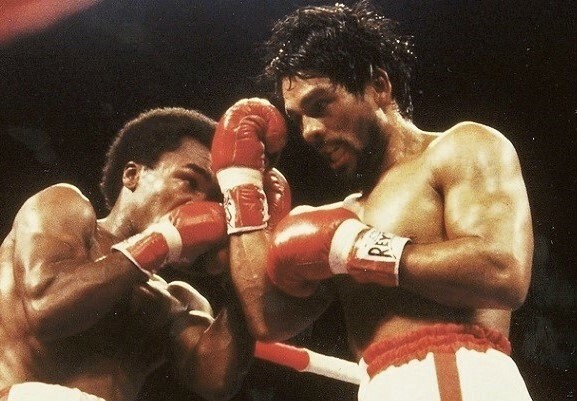 But 38 years later and the memories are still fresh: Sugar Ray Leonard, Roberto Duran and the fight the entire world could barely wait to see. It’s easy to forget how huge that event was, simply because the world has changed so much. 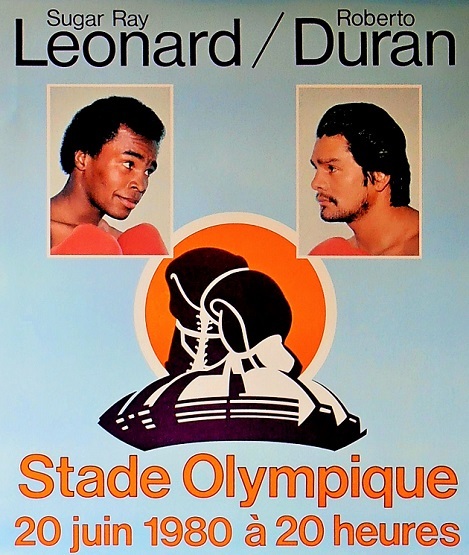 But for boxing fans who witnessed it, the first Duran vs Leonard clash remains unforgettable. Of course, big league boxing was different back then. Not to mention bigger. In a time when most had only a dozen channels on their televisions, before pay-per-view, before the internet, a superfight in the post-Ali, “Rocky Balboa” age was truly a massive, global event. But still, this was something unique. Sports fans were accustomed to only heavyweights commanding the big crowds and the big money. And no Latin-American boxer had ever attracted such keen interest from the general public and your average sports fan. 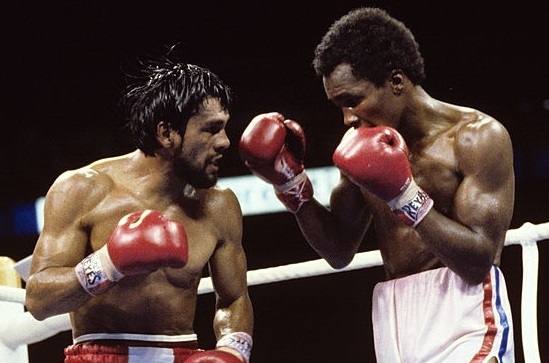 Both Duran and Leonard were more than just boxers; by 1980, they were superstars. And this was more than just a championship boxing match. It was the one fight everyone somehow just knew would be something memorable, something momentous. The contrasting personalities, backgrounds and ring styles created an irresistible contest, the fight everyone wanted to see. It was not only one of the most lucrative matches in boxing history; it was a sports event of global significance, the richest prizefight in history, and a record breaker for closed-circuit television. In the months leading up to June 20, that anticipation and excitement was impossible to overlook. Cover stories and feature articles ran in all the major magazines. Huge ads appeared in national newspapers and pre-fight hype was on prime-time television. Major venues showing the closed-circuit telecast such as Madison Square Garden were packed to the rafters. And the morning after, reports of the Duran vs Leonard battle were not just in the sports headlines, but actually leading the news stories of the day. Interest remained so high, the contest was aired on prime-time television weeks after it had taken place. Interest in the fight was so high that the closed circuit telecast sold-out major venues. The organizers of the bout chose Montreal as the site because it was the city where it all began for Sugar Ray Leonard, where four years earlier he captured the hearts of millions of Americans by winning an Olympic gold medal for the U.S. His flashy boxing style, his television interviews with Howard Cosell highlighting his natural charm, and the story of how he competed with a photo of his sweetheart taped inside his boxing shoes, all helped to make him a star and bring lucrative endorsement contracts from 7Up and Nabisco. Surely the memories of his Olympic triumph, just four short years ago, would translate into a pro-Sugar Ray crowd in Montreal, as opposed to the pro-Duran Hispanics who would have flooded the stands in Las Vegas, New York, or Los Angeles. But it didn’t work out that way. “Les Québécois” make up their own minds, and they weren’t about to cheer for the media darling just because the television networks and corporate sponsors expected them to. Duran also made a shrewd move to win over the locals. Fresh off the plane, Duran told reporters he loved the French-Canadian people and was thrilled to be in Quebec. While training in Montreal he wore a t-shirt emblazoned with “Bonjour Montreal!” To further ensure the locals stayed in the challenger’s corner, Duran’s entourage carried aloft not only the Panamanian flag during the long walk to the ring, but also a huge blue and white Fleurdelisé. Unexpectedly, and for the first time in his career, Leonard was competing in front of a hostile crowd. And it was, by far, the biggest crowd of Leonard’s career, not to mention Duran’s. 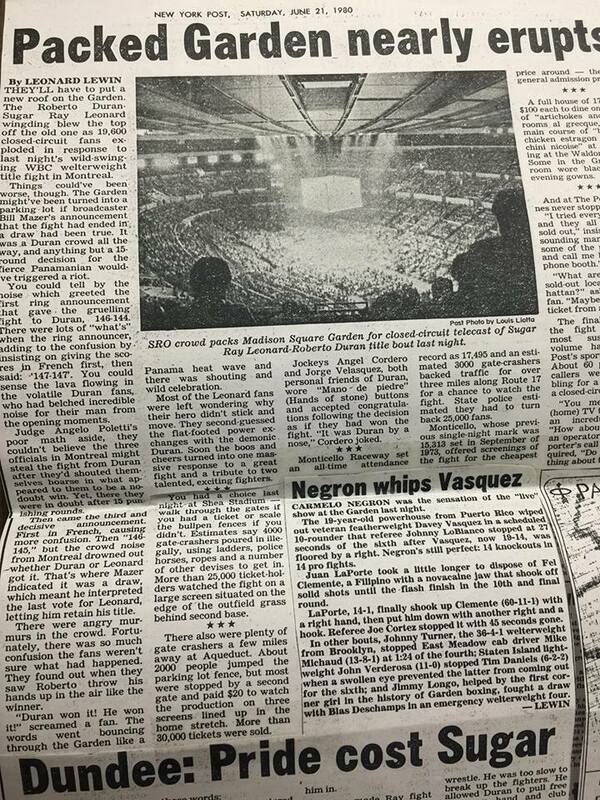 Montreal’s massive Olympic Stadium accommodated over 46 000 fans that wet June night, one of the largest gatherings to attend a boxing match anywhere in the last several decades, testament to the widespread excitement inspired by the fight. And thankfully, the battle itself more than lived up to the hype. 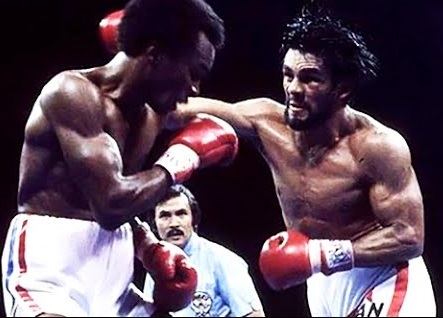 Duran vs Leonard I was a Greek tragedy in three acts, a thrilling, fast paced, grueling war that ebbed and flowed, Duran dominating the early rounds, Leonard coming back in the middle frames, and both men battling with fury in the final stages. The contest was so competitive and hard fought that the outcome remained in doubt until the moment the official decision was finally announced. 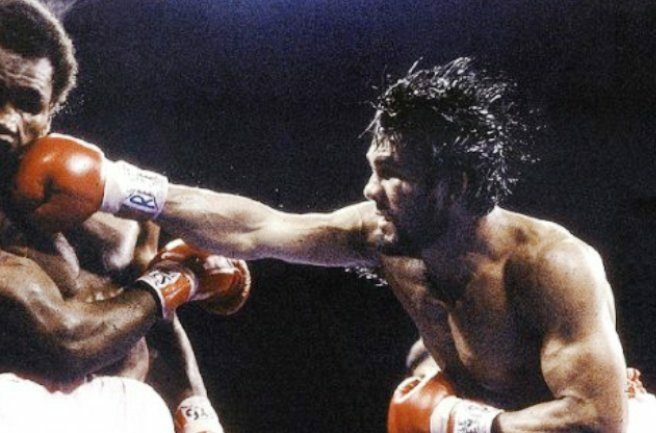 But in the end, the night, irrefutably, belonged to “Manos de Piedra.” He dictated both the pace and the terms of the battle while attacking relentlessly, letting his punches go without hesitation or doubt. The champion more than held his own but Roberto’s furious assault and constant aggression were aided by two factors. First, there was Leonard’s willingness to box flat-footed. As he showed in the New Orleans rematch, Sugar Ray was perfectly capable of using shifty footwork and lateral movement to off-set Duran’s attack. But in Montreal he wouldn’t, or couldn’t. Perhaps it was a bit of both. 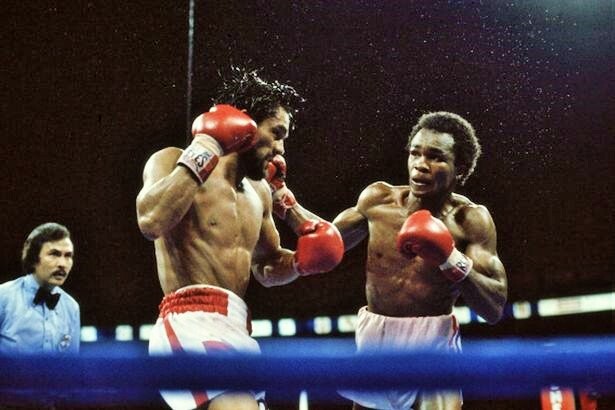 In any case, Leonard did not seek to avoid exchanging punches with Duran on the inside, quite the contrary, a tactical choice which greatly reduced his chances of winning. Second, Duran’s trainers had voiced their displeasure regarding the selection of the referee, complaining that Carlos Padilla had a tendency to separate fighters quickly and prevent aggressive boxers from working inside. As Exhibit A in their argument, they pointed to Padilla’s handling of Vito Antuefermo’s defeat to Alan Minter earlier that year. Ray Arcel even publicly approached Padilla to say, “You’re a good referee, but I only hope you let my boy fight his fight inside.” The pressure worked and both Duran and fans hoping for thrilling action could not have dreamed of a more hands-off official, Padilla often slapping gloves away instead of breaking clinches and giving the challenger ample time to work at close quarters. The end result of these two factors was Duran had the perfect opportunity to seize the initiative and impose his will. And no one ever had to ask Roberto twice. And yet the fight was deadly close, with both men offering astonishing performances and winning their share of rounds. The battle demanded the very best of two truly great champions and for both “The Brawl in Montreal” ranks with the finest efforts of their illustrious careers. 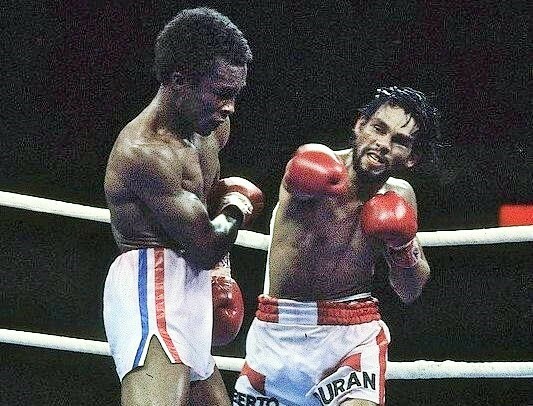 Among all the “superfights” of recent decades, Duran vs Leonard stands out for the skill on display and the sheer intensity of the combat. 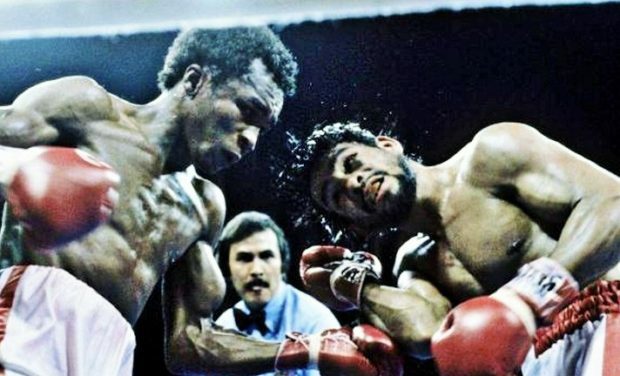 In the end, Leonard’s hubristic attempt to beat Duran at his own game, on the inside and toe-to-toe, while making for an amazing fight, proved ill-advised. The desire to show he was as tough and as game as the Panamanian was Sugar Ray’s tragic flaw, if you will. The judges scored Roberto the victor, and while the match was unquestionably a very close affair, there were no serious complaints about the verdict. 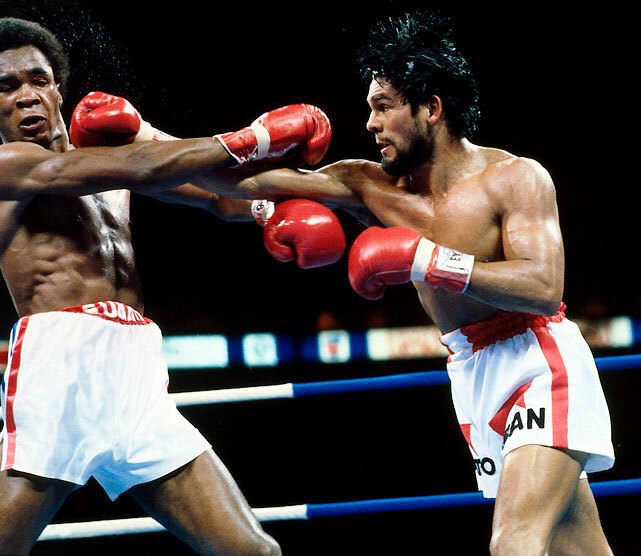 Duran vs Leonard I was not only a great event in and of itself; it ushered in a decade of “superfights” between new stars in the lower weight divisions. In years past, it was primarily the heavyweights, and especially Muhammad Ali, who commanded huge purses and major media attention. But in the 80s, Leonard, Duran, Thomas Hearns, Aaron Pryor, Marvin Hagler and Alexis Arguello all had their share of the spotlight and earned millions of dollars. And it was that first thrilling war between “Stone Hands” and “Fast Hands” that made it possible, that lured scores of new fans to the sport while proving big bucks could be made with the smaller men. At the final bell Duran knew he had triumphed. 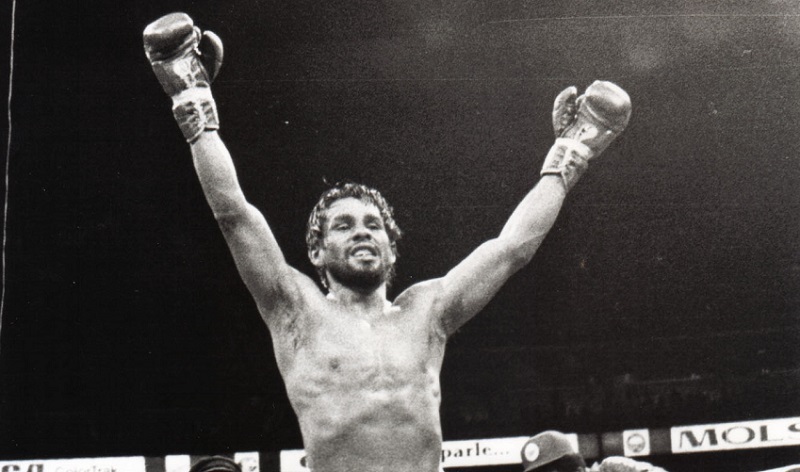 And needless to say, this was the greatest victory of Roberto Duran’s career, a superlative performance and a win which capped an incredible decade-long run at the elite level of the sport. His record now stood at an astonishing 72-1 with 55 knockouts and boxing pundits were liberally comparing him to the true immortals of the past, putting the bearded warrior with the defiant scowl and arrogant swagger in the same league as Sugar Ray Robinson, Joe Louis and Henry Armstrong. Given all that he had accomplished, along with his astonishing performance against the younger, faster and naturally bigger Leonard, these comparisons were entirely fitting. Which of course made the fiasco in New Orleans, just five short months later, all the more tragic. Spot on. Duran had made his mark as possibly the greatest ever lightweight, and Leonard went on to become the only “king” to beat the other three. Two all-time greats right there. This fight was very close. Other than rounds 2 and 3 the fight was even. Duran dominated,he forced Leonard to fight back for the sake of survival. Duran immediately took away the jab, worked the body and took Leonard’s legs. It wasn’t close at all. Watch the fight, Duran takes much less punishment and landed many more clean shots. What few people know is Duran took his foot off the gas in the last part of the fight because someone had tipped him off about the cards. He knew Leonard couldn’t catch him barring knockdowns so he made a strategic choice. Which made the fight closer, although for the wrong reasons.